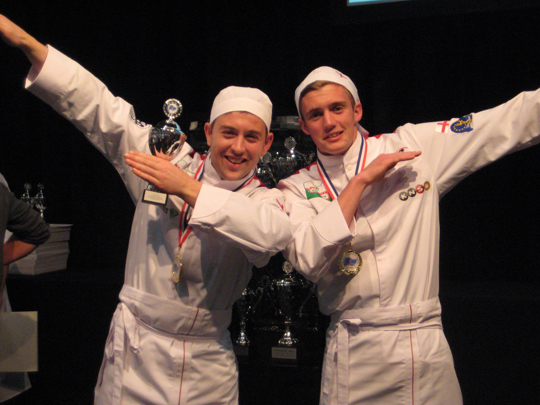 National Federation of Meat & Food Traders (NFMFT) entrants Luke Haigh and Mathew Gothard acquitted themselves really well at this year’s International Young Butcher Competition, held in Holland last week. Luke Haigh and Mathew Gothard delivered for England. Luke Haigh won third prize in the ‘Regional Speciality’ category of the competition with his ‘London 2012 Olympic Pie.’ He was beaten by Mathius Mache from Austria (2nd) and category winner, Switzerland’s Marco Muller. Luke and Mathew competed in six categories over two days against strong competition from Austria, France, Germany, Greece, Holland, Luxembourg and Switzerland. Together, Luke and Mathew improved on all previous UK performances lifting individual and team rankings off the bottom of the results table. With Luke finishing eighth and Mathew twelfth in a field of fourteen the team finished in fifth place ahead of Austria, Luxembourg and Greece. Other category winners were France (2nd) and Holland (3rd) who won six out of the ten trophies on offer including International Young Butcher 2012. The coveted title went to Marco van der Haut who with Dutch team mate Juan Lopez Raven, placed third overall, lifted the team trophy as well. The competition is organised annually by the International Butcher Confederation (IBC) and the NFMFT has been supported with sponsorship from EBLEX, BPEX, Meat Training Council, Worshipful Company of Butchers, RAPS, Gesame, Weddel Swift and Leeds City College.